This solid bike lives up to its brawny name. With a rugged 48-volt, 500-watt silent motor, the Destroyer is made to leave others in the dust as its rider conquers new trails, both on and off the road. The 4-inch wide tires on this e-bike have aggressive knobby tread to hug the turf and carry the rider over rough terrain with confidence. Pedego’s Destroyer bicycle can be pedaled with relative ease over sand, dirt and other wild landscapes. It zips along at a top speed of 20 mph, as required by Federal law to maintain its status as a bicycle …though riders may think of it as a two-wheeled tank. The Destroyer comes in three shocking colors: neon yellow, flame red and green camouflage. 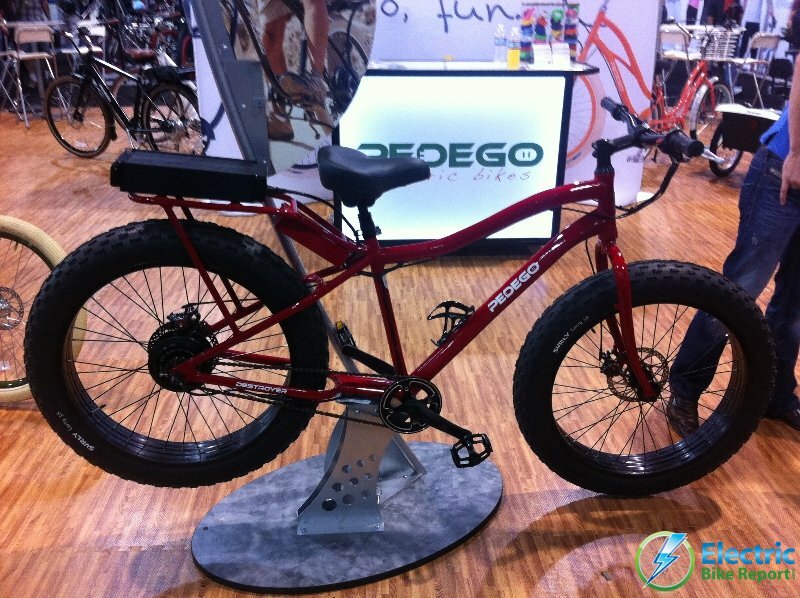 Pedego dealers will make the Destroyer available for test rides this holiday season. 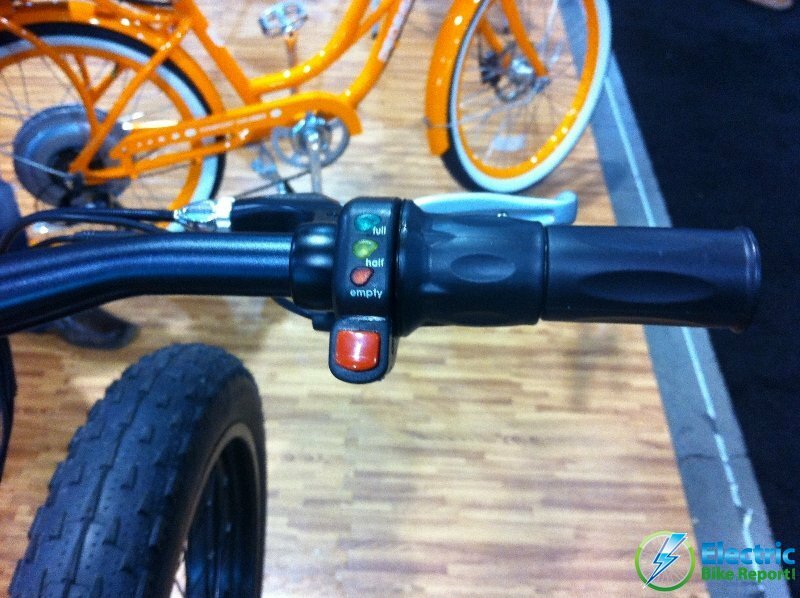 Meanwhile, shouts of “Yeeeehaaaa!” will continue to be heard all around the e-bike test track at the Interbike expo. Retail price is $3695 for the off-road ride of a lifetime. With more than 750 companies representing more than 1,200, brands, the Interbike trade show lives up to its billing as the largest annual gathering of the bicycle industry in North America. This event provides a one-stop opportunity for bicycle enthusiasts and merchants to connect with members of the entire industry, discover emerging trends and learn new business ideas at Interbike University. 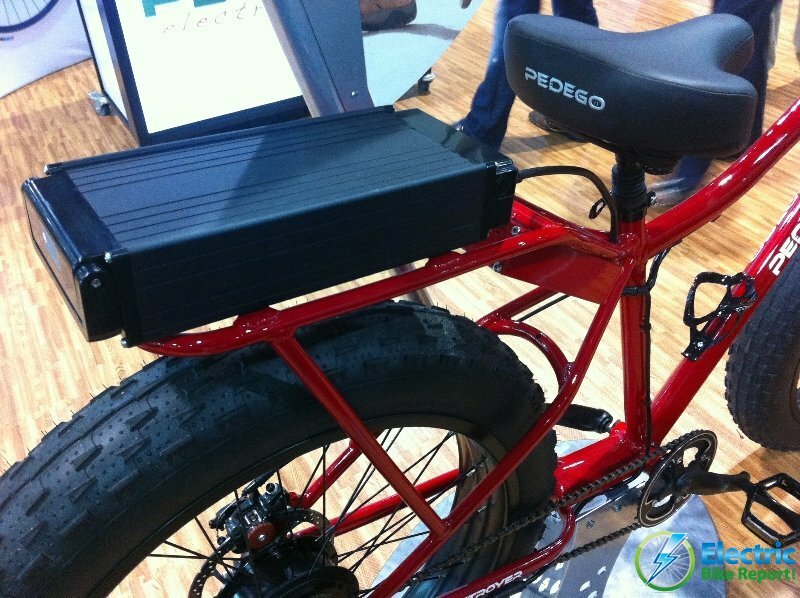 Diversity is key, with companies representing many forms of bicycling, including electric bicycles, the most noteworthy of which is Pedego Electric Bikes. 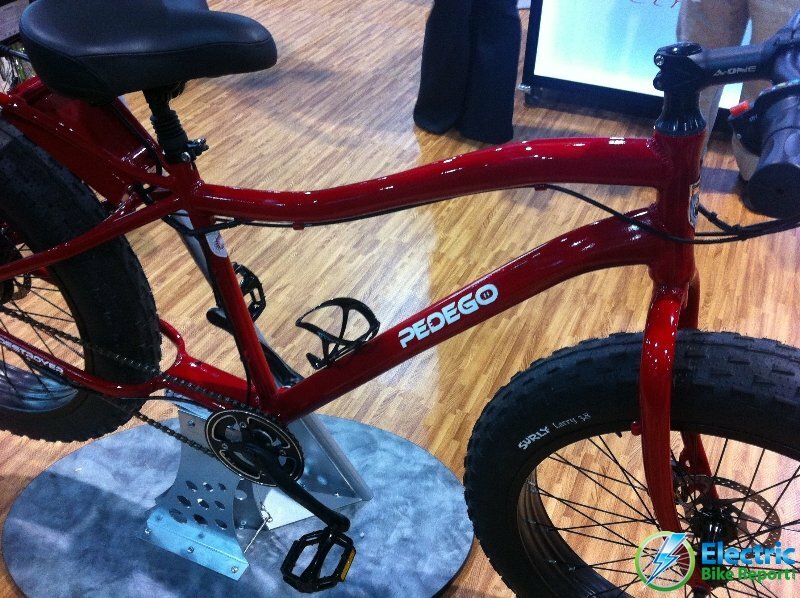 Pedego®, the world’s most renowned electric bicycle, built its reputation by creating the coolest electric bicycles outfitted with the latest in electric bike technology. With their chic, stylish designs complemented by a built-in silent electric motor, Pedego® offers a cost-effective and green alternative for transportation, exercise, recreation and fun! What do you think? 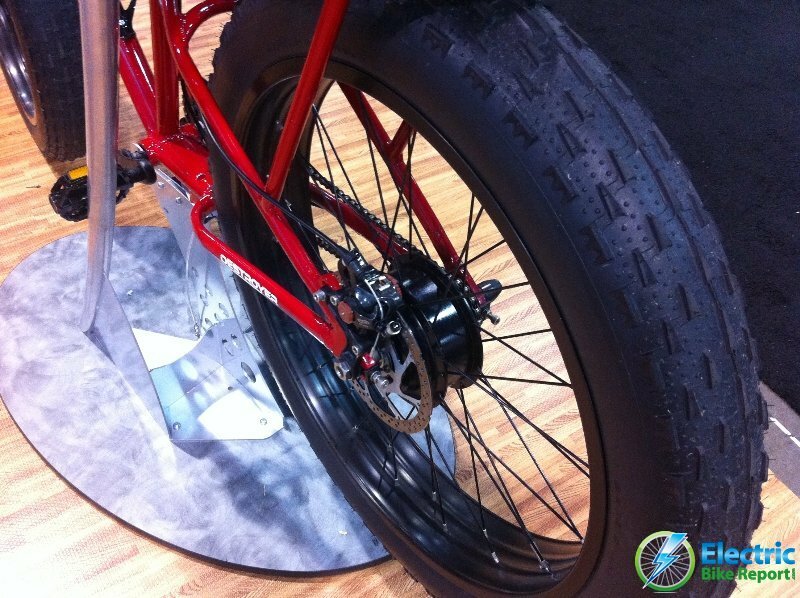 Would you like to ride a “fat tire” electric bike? Where would you ride it? Please leave your comments below. I would love to have one! I think they are way overpriced for no suspension and only a 500 watt motor.I can’t imagine that bike trying to take me and all my 240# thru sand and mud. The final specifications and pricing may change your mind. The motor gearing and amperage plays a huge roll in the performance, not just the watts alone. I weigh about the same as you do so no worries, the final product will carry you through sand and mud. We showed 2 of the pre-production samples that we built. The other ones are out being field tested for performance and durability. The big tires, thick wheels and other robust features do make it a little pricey. It’s not a mountain bike but rather a trail bike for off-road riding. We built a 750 watt version that kicked but it only went 4 miles between charges. My guess is the final product will be a 600 watt motor. I am happy to see the turn to fatter tires. I think there is so much that canbe done to create such fun on the dirt. The electric bike is lower impact than a noisy internal combustion. With 4 inch tires, there may be less need for much suspension. Thanks for the info! Thanks for the reply Don. Can’t wait for the final version. Guess I will have to start saving my $ and sell my Cruiser.What are the color options and will you have a low bar version for the ladies and us old farts? hmmm maybe I could test one??!! Looks like it would hold up on the mountain roads up here. I have had two flats in a month and need something heavy duty. Will you make a “fat tire” street road bike? Any true road bike needs fenders. Does the wide tires cause a lot of tire friction and reduce efficiency? Front wheel motor would be a better concept as this would allow you to be pulled thru the softer surfaces (sand, mud, etc) while pedalling provides the push to keep you moving. 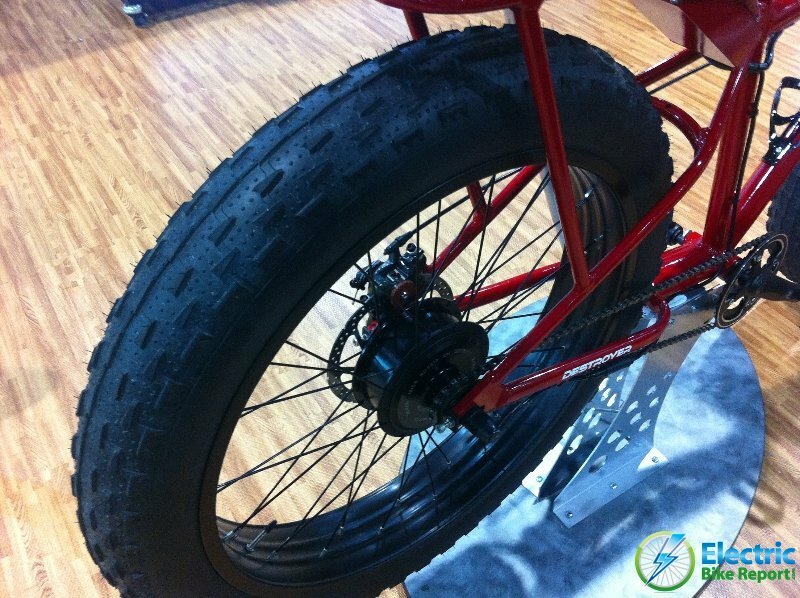 The 4inch tires will be so significant a drag that this bike will not be able to offer any long distance possibility. With 2inch tires and a 240# rider I easily get 8-10miles on a 9Ah battery with appx 3/4 charge. This is on street on totally flat conditions (OK so not totally flat but the 10-20 foot altitude change over 8 miles doesn’t amount to hill climbing…Chicago is a bike commuters paradise…until winter, but there are many that are 12month commuters in the area). A 4inch tire will dern near half that range just in road/air drag. And Prodeco’s battery placemnent and support system cannot take rough surface riding. I have had 2 different styles give me fits due to poor design and lightweight construction. I am currently using nylon straps to hold my battery because the plastic clips on the second battery system the company supplied me with just snapped off on my first ride with the new version. My feeling is the rear rack mounting allows a force to be applied to the battery holding method (in the first 3 poprivets to hold the battery and power unit to the seat post mounted rack which even with supports to the rear dropout bracket just was not capable of dealing with street surface, speedbumps and well used trails) and the newest system had only 3 plastic molded clips on the battery to hold to the admittedly more robust rack mount power unit. Plus the battery system IS NOT EVEN WATER RESISTANT. Riding in muddy wet conditions will cause battery problems (I had one replaced for failure in a rain shower…not storm, shower that didn’t soak me thru on my commute. So stick with a good mountain or downhill frame and strong legs or look to better features for your conditions, 4inch tires will be no solution if you wanna do distance and riding. Great and exiting look, I’m holding off getting an e-cruiser until the electric fatboys are out. As I’d be riding suburban/urban You should include a small LED headlamp in the design and a short fattie fender for puddles and slush.